Digital Insulation Tester @ 125/250/500/1000 V DC, 4 GΩ, 3½ digits For measurements of Insulation, DC and AC voltage, Continuity, according to VDE-0413. Moving Coil Meter Analogue Insulation Tester @ 250/500/1000 V DC, 400 MΩ Every electrical apparatus and installation need to be safe for the user and for the equipment itself. Electrical conductors of electricity need to be insulated from each other, so that they do not create electrical hazard. Badly insulated circuits can create leakage current which can be dangerous and trip your GFCI, RCCB or ELCB. Each country regulates those levels at which the insulation is acceptable. Check the continuity of wires, complete circuits connections, closure of contacts, circuit breakers, fuses, bounding resistance of connections, etc. are all very important. Insulation Tester @ 250/500/1000 V DC, 2 GΩ, 3 ½ digits For measurements of insulation, AC voltage, continuity, according to VDE-0413. Digital Multimeter 3 ¾ digits 23mm, Insulation Tester @250/500/1000V DC, 4GΩ, Frequency Meter Multifunction meter with integrated protection frame combined an automatic digital multimeter and insulation tester, ideal and essential for electrical installation. The 3 ¾ digits, 23mm LCD display (max. 3999) with function symbols, backlight guarantee easy and exact data aquisation. Measurements of DC V, AC V, DC A, AC A, Ohm, Frequancy, diode, continuity test and insulation measurements according to VDE 0413 part 1 are the most useful features. 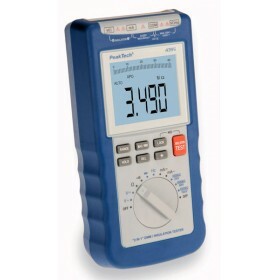 HV-Insulation Tester @ 5000 V / 300 GΩ Measurements according to VDE 0413. New high accurate, rugged testers with a two-line (16 digits) LCD-display, especially designed to read accurate measurements in harsh environments. Internal guard circuitry to eliminate the measurement errors due to surface leakage current. The tester is controlled by the latest CMOS microprocessor with test visual and audible early warning function. Long calibration interval, EEPROM-technology (Electrically Erasable Programmable Read Only Memory), energy save program to prolong battery life, bar graph to show the test voltage (rise and fall) and battery life during the measurement, flash-test protection, current limit, power limit, autodischarge detector-indicator, auto-off shuts down the tester, etc. HV-Insulation Tester @ 10000 V / 600 GΩ Measurements according to VDE 0413. New high accurate, rugged testers with a two-line (16 digits) LCD-display, especially designed to read accurate measurements in harsh environments. Internal guard circuitry to eliminate the measurement errors due to surface leakage current. The tester is controlled by the latest CMOS microprocessor with test visual and audible early warning function. Long calibration interval, EEPROM-technology (Electrically Erasable Programmable Read Only Memory), energy save program to prolong battery life, bar graph to show the test voltage (rise and fall) and battery life during the measurement, flash-test protection, current limit, power limit, autodischarge detector-indicator, auto-off shuts down the tester, etc.